Anyhowz, I know it's hard to get a feel for the colors in the photo above as this is yet another of my ubiquitous crepuscular nocturnal shots. There are 3 blues, 1 green, and 1 grey. I could have sworn I had 8 of the grey, but I only saw 4 balls. Not sure where the other 4 went. Given away? In some other box? Of the green, I have less than 8 balls (sorry, I didn't really count them, I just noticed that there weren't 8... I think it was 6 balls), then I later recalled that I had used some for Sue's Chemo Cap. It was such a long time ago that I forgot that I had played with Peru. I've been so out of it today. I kept thinking it was Monday and that I had to move the garbage cans out to the curb (because Tuesday is garbage pickup day). I started watching Pride & Prejudice (Keira Knightly version). I'm not even halfway through the movie and I'm not really liking this version. I keep thinking back to the other Pride & Prejudice (Jennifer Ehle, Colin Firth) version. Well, I'll try to watch a little more this evening but am not feeling very hopeful. This is not to say that I can't like two versions of the same movie. I like both Gwyneth Paltrow's Emma and Kate Beckinsale's Emma for different reasons (although I do have a predilection for the latter one just a wee bit more). Does anybody remember Kate when she was less famous? Like back when she was in Much Ado About Nothing? That was a fun little movie, and I loved Kenneth Branagh's soliloquy which appeared as though it was done in one continuous shot (much like they almost managed to do in U2's video for The Sweetest Thing). This Ariel Hat is intended to go with my Ariel Scarf. I don't know how popular scarf & hat sets are, but I imagine there must be some interest since I've received inquires about "sets" for my other patterns. I used less than 3 balls of Marly for this hat. One ball for the cable band. And I'm guessing one and a half ball for the body of the hat; I started with one ball and then continued with a remnant ball which was probably a half ball. There's some question about actual yardage for the yarn, the yarn label says x yards and Elann measured it at y yards. 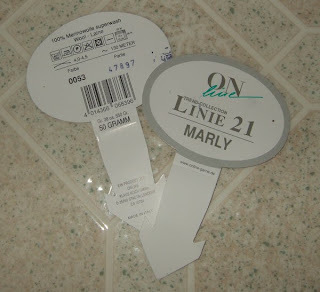 For more info on Marly and yardage, look here where I mention numbers. 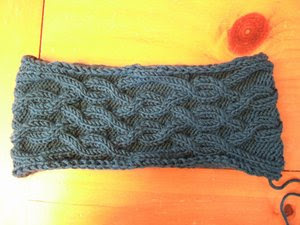 I suppose I could have made the cable band narrower, but I felt that this showed off the pattern better. Being double layer around the head, this is definitely going to keep you warm. :-) I should probably block the hat slightly so it looks more even. 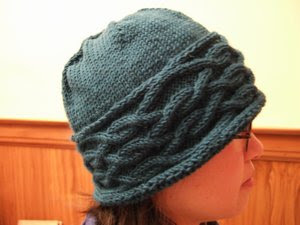 This is actually not my first cable turn-up cuff style hat. The first one I made was this pink chemo hat back in Dec 2005. 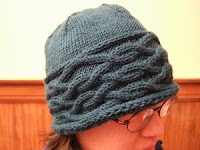 When I made this hat, I slipped the first stitch of each row purlwise and knitted the last stitch of each row. I thought that the selvage would help me pick up stitches around the edge after I grafted the cable band. I have no idea whether it makes any difference. Pattern revised on 20 January 08. I have 4 balls each of Highland Wool in indigo heather, red maple, and ruby. I only got 4 balls because I was thinking of scarves when I ordered them. I have 5 balls each of Highland Silk in 4 different colors, again thinking of scarves when I ordered them. Since the pattern calls for 6 balls of worsted, that would probably translate to more balls in a thinner weight? Would superwash wool work? I have 10 balls of Cleckheaton DK superwash wool in brown which was earmarked for something else, but I can use that instead. I have 8 balls each of Austermann Peru sport weight in 5 colors, not sure if that will be enough yardage? Never used it so don't know. I think it's thinner than DK, maybe thinner than fingerling? Forget where sport weight falls. I have 5 balls of Super Tweed, forget what that was, worsted? 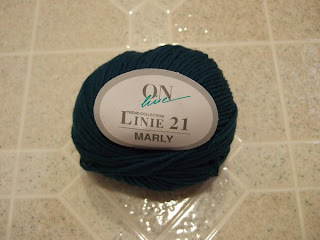 Oh, just realized that I have tons of Marly superwash wool. 10 balls each of estate wine, wild berry, newport blue, amethyst shadow, and raphael purple. 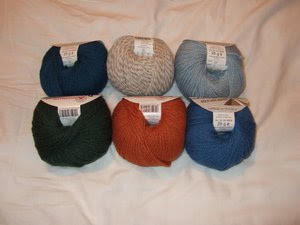 Which yarn do you think I should choose for my very first shawl? I posed this same question on the KAL. Lisa thought I should use Debbie Bliss, Joan thought Austermann Peru, Cate thought something bright because of the name of the shawl. As much as I like the BC & BS, I'm thinking that would not be a good choice because I would like to stay motivated and finish the shawl before the next Ice Age. :-) Of course I suppose I could double it (would that make it worsted weight?) although that would also mean juggling two balls who would be itching to get tangled up. BTW Joan, I need to check which Peru colors I have and will get back to you about whether I have the color you're looking for. And if I remember later, I want to ask you how many balls of Peru you are using for your Luna Moth Shawl. I still don't have enough experience to figure out how much yarn I need for projects. I've been thinking about knitting skill levels and where I fall in. 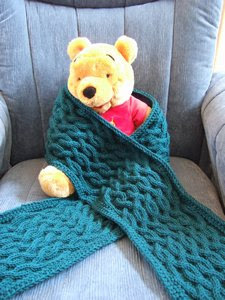 I still consider myself a newbie knitter since there is still sooooooo much that I don't know and would like to learn. 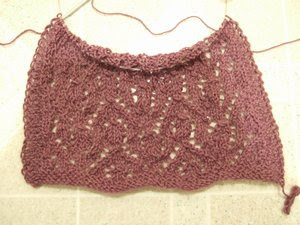 I still haven't tackled a "real" garment, which I consider to be a lace shawl or sweater/cardigan/top. I still haven't worked up to socks, although I did start reading a few pages of Sensational Knitted Socks. I didn't get very far, didn't even reach the Class Sock. I think socks will have to wait. I do wish this book had a different binding which would lay flat (think O'Reilly books). I recently received my flyer for Knitting Universe's Camp Stitches at Asilomar (Monterey, CA) June 14-18, 2007, and was looking over the classes offered. Japanese Knitting Techniques looks interesting, I don't know much about that and how different they do things. I don't qualify for any of the courses though, since their "easy" skill level says, "you should know the basics and have made at least one garment." Ok, I do know the basics, I think, but I haven't made a garment yet. I do have to start thinking about knitting a vest for my Mom. The thought stresses me out since she's really picky and is the ultimate critic. She says she wants a vest with a V-neck, and it has to have a flat horizontal hem at the bottom. Oh, and when she says "vest", she really means a button-down type, not a pullover type. So I'll need to look for a vest pattern that fits her criteria. I have more computer woes. My laptop AC adapter is wonky. It randomly drops to battery power for no apparent reason. I can tell when this happens because my laptop has a very loud fan and it turns off when it drops to battery power. I have already tried switching the AC adapter cord and still experience the problem. For both cords, I would have to wiggle the end of the cord that plugs into the back of the laptop to get it to go back to AC. I think maybe these tow cords don't like being bent/curved. I tried putting something around it to help straighten it, but that isn't a big improvement. The vicissitudinous power situation is driving me nuts, and I'm starting to worry about both AC adapters dying on me and then having no way to power the laptop. DH keeps telling me, "there's a fix for that." What he means is upgrading to a MacBook Pro. He's been saying this for quite a while, I just haven't accepted the offer yet. Oh, the thought of having to transfer files over to another laptop, buy a whole new set of software, customize how everything looks/works, and then learn how to use a Mac is just too overwhelming for me. What if there's something I used to do on the PC that I can no longer do on the Mac? As for transferring files... I wonder if I can put my PC laptop hard drive into one of those external HD enclosures, and plug it into the Mac's USB port to transfer files over? 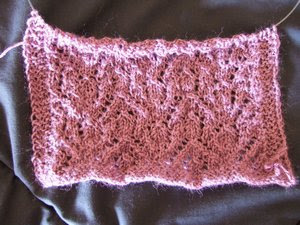 Oh, I just discovered that G Girl has finished knitting my Persephone Scarf. You can see her scarf here, and a different photo of it here. 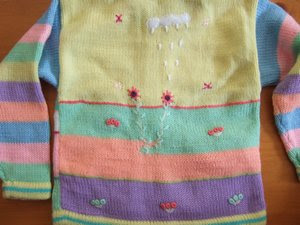 Here's a close up of the front and back of the sweater. 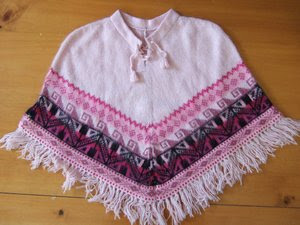 And here's a photo of the poncho, also a large size M won't be able to wear until she's much older. Forgot to mention teatime ... I decided to make a pot of tea today. I'm having Lupicia Lichee Oolong tea. They have 80+ shops in Japan, 2 in Australia, 4 in Taiwan, and only 3 in the United States. One shop is in Hawaii, and 2 are in San Francisco. How convenient for me! But that will change once we find a new house about an hours drive away from SF. Yes, we're still house hunting. It's getting tedious. It looks like we just need to come to terms with how much we'll actually fork out for a house. We're feeling like we're in the same boat as a few years back when we were actively looking for houses in cities A, B, & C. We had our price range, saw a house we liked for X and thought we could get it by making an offer for X. We didn't want to see how the game was played, that you would need to make an offer for X plus $100,000. As for the down payment and loan thing.... we have a modest down payment with a loan from my Mom, so we'd still need to get a loan from a financing company for the remainder of the house amount ...but at least the amount of the latter loan would be less than what we would have needed to borrow had we not gotten a mini-loan from Mom). Even with this "smaller" loan from the financing company, we have determined that with our "mandatory" household expenses (food, utilities, etc) and the estimated monthly mortgage payment (mortgage, tax, insurance, etc), we will have absolutely no savings from our income. Now that depresses me!!! 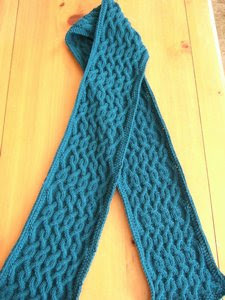 I finally managed to clear off the coffee table during the daytime to take a quickie more zoomed out photo of my Ariel Scarf. And when I say quickie, I really mean it. I only managed one shot before Miss M pulled the scarf off the table. But you do get a better look at the cable pattern in this photo. And I wanted to put the photo of the hat and scarf in one post so you can see them together. Much easier that way. :-) Both scarf & hat were made of the same yarn & color. The hat picture just looks off because it was taken at night. Miss M has already "taken ownership" of the hat. BTW, is it just me or is everyone else being prompted for username/password every time you click on the blogger "Dashboard" link? Teatime... I made a pot of tea today. Lupicia Bravissimo. These are the three words that come to mind when I think about the whole housing situation we've been in since last Thursday. Well actually, those three words come to mind when I think about the Selling Agent who listed the house we were interested in. I mentioned yesterday that we were close to making an offer on a house. Well it all came to a halt this morning when our realtor informed us that the Seller accepted a "pre-emptive offer" from the very beginning. A pre-emptive offer ... have you ever heard of that??? Our Realtor hadn't. He followed up on this and then later told us that it was a done deal and we had no chance at the property. 4/17 Tues: House goes on the market. 4/19 Thurs: We meet our Realtor to see the house. 4/20 Fri: We ask our Realtor to get us the Disclosure Packet for the house. BTW, I have to add that we kept checking back with our Realtor on the disclosures. He was definitely working on it, but the Selling Agent is difficult to reach and her voice mail is full. 4/23 Mon 8:25 AM: Our Realtor informs us that he spoke to the Selling Agent on Sunday, and that she would upload disclosures online on Monday but she hadn't yet done that. The Selling Agent also said they would be looking at offers on Wednesday. 4/23 Mon 2 PM: Our Realtor spoke to the Selling Agent. The Selling Agent is still trying to get the disclosures online, mentioned that interest has been pretty strong but she does not yet have a good feel for how many offers may be coming in. 4/23 Mon 8:07 PM: Our Realtor finally gets the online link to the disclosures. He also mentioned again that they are looking at offers on Wednesday and that so far it looks like about a half dozen or so. 4/24 Tues: We look at the disclosure packet. DH had a long day at work on Monday (late meeting, followed by an escalation which went up to the VP level) so we both had long days and we were both too tired to read through 163 pages of the Disclosure Packet that night. I looked at it during the day on Tuesday while my Mom babysat M, and DH looked at it Tuesday night and called our Realtor to let him know we'd like to look at the house again on Wed and possibly make an offer afterwards. 4/25 Wed 8 AM: Our Realtor calls to inform us that we might not have a chance to make an offer. He has discovered that the Seller has already accepted a pre-emptive offer. I don't understand why the Selling Agent kept saying that they would look at offers on Wednesday when she already knew the Seller had accepted an offer. 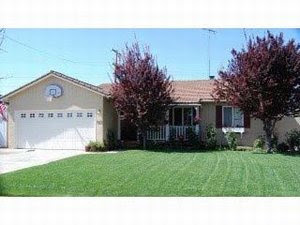 The Seller accepted the offer before the Sat Open House. The entire point of having an Open House on Sat would be to generate interest and thus more incoming offers. I can understand if an offer has been accepted and they are continuing to show a house, but this Selling Agent should make that clear (which is what other Selling Agents do, btw). The Selling Agent made no mention of the house being "sale pending". And she kept on saying that they'd look at offers on Wednesday. Seems like unprofessional behavior to me. Am I wrong to have these three words running through my head today? But now I know. I will be wary of any future houses on the market whose listing agent is Debbie Wilhelm of Coldwell Banker. BTW, I have nothing against Coldwell Banker. One of my favorite Realtors is Roger Dewes of Coldwell Banker in the mid-peninsula (Burlingame, San Mateo, etc). He is the quintessential real estate agent; we worked with him a few years back when we were looking in the mid-peninsula. Our current realtor, who specializes in the south bay, is pretty good too ... he is sort of a Roger Dewes 20 years younger, lol. 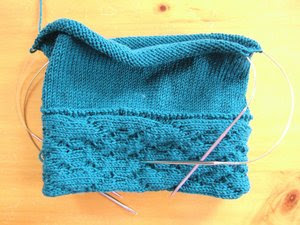 Anyhowz, I still have made no knitting progress but I thought I'd share a photo of the Ariel Hat in progress. You can see the cable band at the bottom -- no, my cables aren't that screwed up, you're looking at the wrong side :-) -- which will be turned up after the hat is finished. Lisa is hosting an Elann Shawl Knit-A-Long. Check out her blog here and here for more details. I was thinking of doing Moonlight Sonata since I have the yarn on hand, but now think it's way too ambitious of a project for my very first shawl. Sun Ray was another one I was considering, but I don't have 6 balls of Highland Wool in one color on hand. However Lisa suggested that I could do it in Baby Silk. I'm not sure I'm up for a big shawl project on fingerling weight yarn (would I ever finish???). Now I'm thinking Sun Ray with -- ok, you yarn snobs will cringe when I say this -- a DK weight acrylic/wool blend yarn. Something thicker to keep me motivated, plus I can use (maybe?) size US8 / 5mm needles which I do have on hand. (There's a shortage of US6 and US7 needles right now). Ok, I actually managed to watch American Idol tonight even if it was after the show aired (thanks to Tivo). So that means I can actually vote for a change! (I usually watch AI a day or two later) ... my opinion still stands, I'm still voting black this year and think one of these gals will ultimately win. My preferences are Melinda, LaKisha, then Jordin. Sorry, no knitting news today. Too busy. Zero stitches worked on today. :-( DH & I are busy trying to decide whether we want to make an offer on a house. Offers are due tomorrow. We actually saw the house last Thurs, and wanted to get a copy of the Disclosure, but the Selling Agent didn't get her act together until Monday 5PM-ish ... that's when the Disclosure was available online. So not too much time to read it over. We were too tired on Monday (it was a long day for both of us), and we had a little bit of time to look it over today but not as thoroughly as we would like. Don't really like the feeling of having to rush into a decision. Ok, I think I've found the needle size to use with Baby Silk. Using US5 needles was definitely not going to work. I tried US6 needles (photo on the right, dark background) and that was a slight improvement. Then I started another one using US7 needles (photo on the left, light background) and I think this is the one to stick with. I definitely like the look unblocked and think it will only get better after blocking. Sorry, it's hard to tell from the photos, and the pic with US7 needles didn't come out very well. I think I must have been smoking the carpet when I noted "US6" needles for my Branching Out scarf. I don't remember what size needle I used, but I'm pretty sure it wasn't US6 ... maybe it was US7 on US8. I do like working with this Baby Silk yarn this second time around. I made 2/3 of the progress you see in that photo while sitting at Starbucks and sipping on my grande Chai Tea Latte. Does anybody else knit at Starbucks? I was the only one. Most of the other patrons had their heads buried in their laptops. The lady sitting next to me admired my knitting and wanted to feel the yarn. She remarked at the softness; I told her it was alpaca & silk. Sarah gave me an idea with her "biopsy blanket". I think I'll dub this scarf my "biopsy scarf". I understand she meant something that was mindless knitting, however that type of knitting would leave me with too many active brain cells to worry about stuff. So this lace scarf is perfect as it requires me to concentrate on the pattern (cuz tinking lace is a qute a pita to do) and do less of any other kind of thinking/worrying. This looks a lot like a headband, lol, but it is really the beginning of a hat to match my Ariel Scarf. I just knitted a strip of the cable pattern just long enough to fit around my head and then grafted it. Now I just need to work on the rest of the top. I did have some trouble with the provisional cast-on... not the starting part, but rather the unzipping part. I know I started with the correct number of stitches, but for whatever reason I ended up one stitch short after I did the unzipping. Don't know what happened there. Tracy suggested hanging my Georgiana Scarf on a hanger to block it, I had never thought of doing that. I wall have to remember that trick! I really liked Lisa W's idea of getting some sort of board that I could lean up against a wall while it dries. This would be great in the long run, especially since it looks like we will move into a smaller house. I have to think about how to implement this though. I'm not really a hands on kind of gal to figure out how to staple quilt batting & sheet to plywood. The sticky cork boards alternative sounds more like something I could pull off. DH had the week off so I did a lot (relatively speaking) of knitting and blogging... but his time off has come to an end which means less knitting & blogging (after this post). I can't decide whether I like how this lacy pattern is coming out. I started out with US5 (3.75mm) needles and it was obviously not coming out right. Then I switched over to US6 (4mm) needles which you can see in the photo above. I know it doesn't look like much, but that little sliver of knitting -- about 5 inches (13 cm) -- is actually the result of many hours of knitting. Yeah, I'm slow; it's mostly knit a few rows, tink back a couple to fix something, knit forward a few rows, tink back a one or two rows, etc. I think the one you see above is much better than the US5 needle version. What do you think? Do you think this will "bloom" after some blocking? Or is it still too tight? 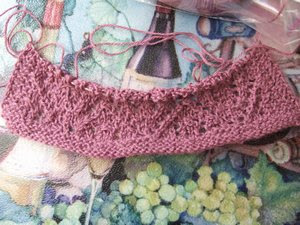 I don't have much experience knitting lace with fingerling weight yarn. I've only knitted with Baby Silk once before when I did my Branching Out scarf. I thought that scarf came out a bit too lacy. I wrote down US6 needles for that, but I'm thinking maybe I was smoking the carpet and meant to write down US8 instead? No idea whether I should continue with the one above using US6 (4mm) needles. Should I try casting on with US7 (4.5mm) or US8 (5mm) needles? I don't have any available US7 needles right now, so maybe I'll have to skip up to US8 if I do that. 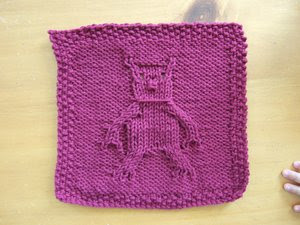 Ursine Cloth pattern can be downloaded from Smariek Knits Yahoo Group. 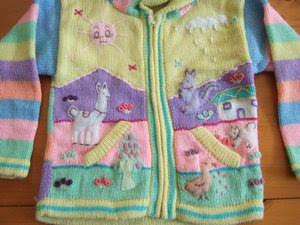 This is for ekittie who is looking for a sweater pattern. Is this the one you were thinking of? I had a doctor's appt today to have something checked out as I've been experiencing something a bit on the abnormal side since December. The doc had a lookie in January and chalked it up to holiday stress, then things seemed normal since then (well, except for the minor cold in Jan & a major cold in Feb). Then it all started again in March/April. I saw the doc today and she decided to do an endometrial biopsy. A what??? Everything in the medical world has to have a sesquipedalian term. Ok, I'll have a biopsy. Hey, it can't be that bad, right? I mean, I've gone through childbirth without an epidural, what could beat that? But then the nurse handed me a consent form to sign, and I skimmed through the text ... take pain reliever an hour before procedure ... cramps and bleeding during/after procedure for a couple days ... continue taking pain reliever every few hours after procedure ... and I was starting to get worried. I asked for some advil. Not sure if it would kick in since the doc was going to do the procedure in a few minutes, but I figure it would make me feel better nonetheless. The procedure really wasn't bad at all. I can't say I'm feeling great, but overall it's not bad. Plus I think it helped that there was a speckled ceiling above where I tried to distract myself by counting all the specks. I counted up to 130 by the time it was all over. The doc told me to take it easy and not do any heavy lifting, which included not lifting M (22+ lbs) too much. Good thing DH is home this week, so he can help with M. When it's just us two, she gets really needy and needs to be picked up & held much of the time. C'est moi? Had a hard time choosing for some of the categories. For art, I could choose food, shell, or Mona Lisa. My kind of treat was tough too, I could go for wine, tea, chocolate, or dessert! And as for what I'd like to be doing, it could be reading, napping, playing on the computer, shopping, watching tv, or the option not available ... knitting. And my kind of drink would be wine or tea. I found the brown cloth and managed to take a pic of it -- in the daytime too!!! :-) I know most people would think brown is more appropriate for a bear cloth, but I really like the wine colored one more. I knitted this in wine before brown. I was trying to find a nice pattern for this Bulky weight Berroco Air yarn. I thought that the Traveling Vine pattern would be nice, but I did not want to do P2-through-back-loop stitches with long cumbersome 14" (35.5 cm) long US11 (8 mm) needles!!! I was just not up to that kind of needle acrobatics. 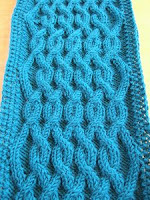 I attempted another pattern, which you can see part of here, but did not like the result after several repeats. I frogged it. Third try is a charm, and this is the scarf I came up with where I thought the pattern suited the yarn (or is it the other way around, the yarn suits the pattern?). The scarf was inspired by the Triple Leaf pattern in the Barbara Walker Treasuries. I still don't like the straight US8 needles after completing the scarf. If I ever need to knit with such large needles again. I will definitely go get myself some circular needles! I found it very tiring to hold the straight needles. 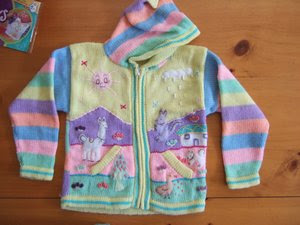 I would slip the right needle through the next stitch, then use my left thumb & index fingers to hold the right needle in place while my left hand released the right needle to wrap the yarn around before completing a knit stitch. It wasn't exactly efficient knitting. There must be some technique I haven't quite figured out yet. Georgiana was knitted in two halves then grafted so the leaf pattern shows up right side up on both ends. That was my first time doing the kitchener stitch! See? I can learn something new. :-) The scarf you see above is unblocked. I haven't yet figured out where to block it. Before M was crawling/walking, I used to block stuff on large towels on the floor. I can't quite do that anymore unless I want my knitting dragged around all over the house. Any suggestions? 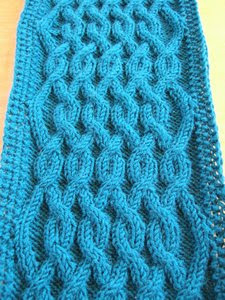 The pattern itself is 15 stitches wide, so I added a few extra stitches on the side to get a bit more width. Unblocked, it is 7 inches wide and 62 inches long (18 cm x 158 cm). I think the length is perfect, and it won't be overly long when I get around to blocking it. The scarf is light & airy around my neck, and I can feel that it is warm. I love how this yarn doesn't feel heavy or bulky around my neck. I'm tempted to get some more Berroco Air, and I'm eyeing the purple Cyberspace colorway. 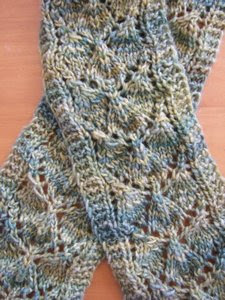 I used 2 balls of the Geothermal colorway for the scarf you see above. 2 June 2007: I finally blocked the scarf and its final dimensions are 73 inches x 8 inches (185.5 cm x 20 cm). What do you do when you have insomnia and can't fall asleep for several hours. This often happens to me. I'll go to bed by 11:30pm at the latest, and then lie there for hours wondering when I will actually fall asleep. Do you get up to do something productive? Do you climb out of bed to go do some knitting? The last time this happened to me, I was wake until 4am!! Just kept looking at the clock... 1am, 2:40am, 3:30am ... ugh. I probably should have gotten up and made some knitting progress. I suppose I could get out of bed and sort through my email. I get a lot of spam. Sometimes they get automagically filed into the Junk/Spam folder, while other times I have to weed through them in my Inbox. Would you believe that I even get spam in French??? Very strange... you'd think that living in San Francisco, people would spam me in Spanish before any other non-English language. Oh and sometimes I get legitimate email misfiled into the Junk/Spam folder; Sometimes I catch it, but I think most of the time I miss those messages. Or perhaps I can read a book during that time. I did finally finish a book I started last August ("For the Sake of Elena" by Elizabeth George). I had been reading it on and off since then. Yes, everything happens very slowly in this house. I've sort of started "Payment in Blood" by Elizabeth George and "Ice House" by Minette Walters. Do you think I'll finish one or both of these by December? Yay, I'm rich! Well, only virtually. I was playing around with the Salary.Com SAHM salary wizard which makes adjustments for your location and job specifics, and it tells me I should be making $185,855. More details here. I've been experiencing a weird Blogger quirk and I wonder if anybody else experiences it too. When I press the "Page Down" button, it dumps me to the bottom of the blog page instead of paging down just a little bit. The "Page Down" button works fine on other websites, so it's just a Blogger thing for me. The "Page Up" button will take me all the way to the top of the blog page. This quick really bugs me! I finally upgraded my other blog, and now need to fix a few things. All my links in the side bar disappeared. Oh well, I had been meaning to update it anyways. Now I wonder what visitors to my blog come for. Is it hat patterns? scarf patterns? or wash cloth patterns? Anyhowz, you might be wondering what that stuff is in the photos above. The green thing is my Georgiana Scarf knitted with Berroco Air. Yes, that's what I came up with after terrorizing my first ball of Air. It was knitted in two halves then grafted so the leaf pattern shows up right side up on both ends. That was my first time doing the kitchener stitch! See? I can learn something new. :-) The scarf is unblocked. I haven't yet figured out where to block it. Before M was crawling/walking, I used to block stuff on large towels on the floor. I can't quite do that anymore unless I want my knitting dragged around all over the house. The cloth is supposed to be a Teddy Bear, but I'm thinking in looks more like a Grizzly Bear, lol. I knitted this wine colored one first. I don't know why but I was compelled to knit one in brown after fishing in my cotton stash and finding one lonely ball of brown yarn. I guess it's similar to how I was compelled to knit my Turtle cloths in green. I haven't gotten around to taking a pic of the brown one, but it looks just like the wine colored one. I was still in a 2-color knitting phase after knitting the Oblique Hat, enjoying getting more comfortable with working with yarn in both my hands, so decided to do something different in my next 2-color hat. This one was inspired by something I saw in a Vogue Stitchionary. The pattern is pretty easy to work, so I consider it "mindless knitting". It's easy to work while watching TV (which is when I did most of the knitting for this hat). You can easily work it without the use of a row counter; you just need to pay a little attention to the colors and remember where to switch colors. My hat above is a bit on the long side, as I wasn't paying attention and just continued around and around a little longer than I had intended before starting the increase, a side effect of watching tv while knitting. This is chemo hat #17 for Cap Karma this winter. 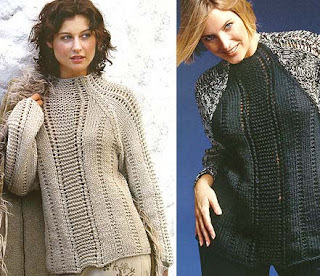 This is a great pattern for using all those little bits of leftover yarn. The minimum amount you would need for a square section is just enough yarn to work 4 rounds, and that's pretty easy requirement to meet! The possibilities are endless. You can change Main Color and/or Contrasting Color however you like, however I suggest you do it on Rounds 1 or 5 if you want to maintain the 4x4 square patterns. Chessboard Hat pattern can be downloaded from Smariek Knits Yahoo Group.